With Halloween less than a week away, I thought this would be a good time to share three of my favorite recipes for making sweet treats with pumpkin! I think you will find it hard to pick a favorite! From by the bay wishing you sweet pumpkin food memories! Preheat oven to 350 degrees F. Butter and flour an 8” square baking pan. ( I find an 8″ square glass baking dish works best). Make the topping for cake by combining all dry ingredients in a bowl. Stir in melted butter and make large chunky crumbs, between 1/4″ to 1/2″ inch depending on preference. Place crumbs onto a parchment lined baking sheet and put into the refrigerator to cool for about 15 minutes. To make filling combine the dark brown sugar and cinnamon in a bowl and set aside.To make cake batter sift together the flour, baking powder, baking soda, cinnamon, ginger, nutmeg and salt in a bowl. Use an electric mixer to cream butter and sugars together until fluffy. Add eggs one at a time and beat well. Mix in the flour alternately with the sour cream and pumpkin puree and mix well. 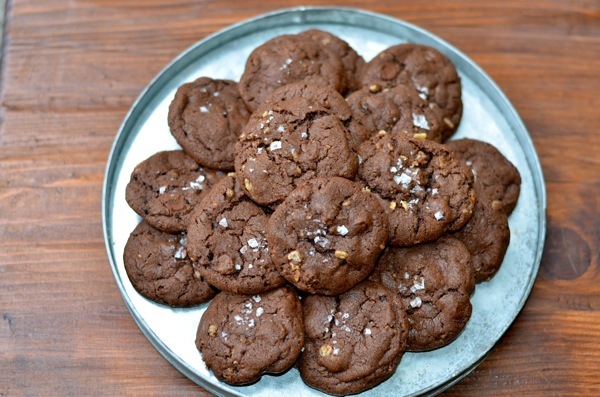 Once combined pour half the batter into the prepared baking pan and spread out with a spatula. Sprinkle the filling evenly atop the batter. Spread the remaining batter on top of the filling. Use a table knife to gently swirl the filling into the batter. Sprinkle the streusel topping over the top of the batter. Place in the oven to bake until golden brown and a cake tester comes out clean, when inserted into the center of the cake. This is approximately 50 to 55 minutes. Remove the cake from oven and let cool on cake stand about 20 minutes before removing from pan to serve. comes our clean from the batter part of the muffin, don’t use the tester in the cream cheese. Remove from oven and let cool 5 minutes before removing from the muffin tray. Serve warm, cold or at room temperature. In a small bowl mix topping by combining sugar and cinnamon and set aside. In another bowl mix together dry ingredient s of sugar, flour, baking powder, cinnamon, allspice and ginger. Using another bowl combine sour cream, oil, honey, eggs and pumpkin puree. Whisk together. Add ingredients to the dry ingredients in the other bowl. Mix until incorporated, batter will be lumpy don’t over mix. 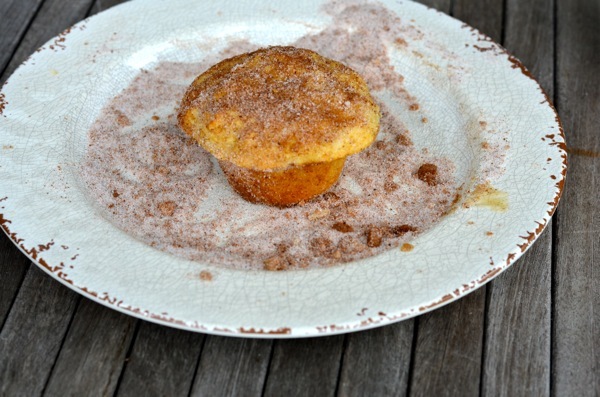 Take a lined 12 muffin tin and fill each muffin tin to 2/3 with batter. Top the batter with cinnamon and sugar mixture. Bake in a preheated 400 degrees F oven for 20-22 minutes or until tester comes out clean. Remove from oven and cool on rack. 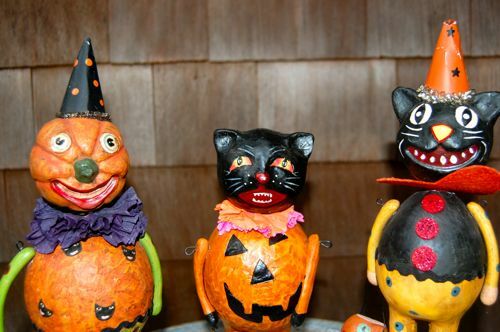 This entry was posted in breakfast, cakes, desserts, muffins and tagged cream cheese recipes, Halloween recipes, pepita recipes, pumpkin cake recipes, pumpkin recipes, pumpkin seed recipes, streusel recipes, sweet treats on October 25, 2014 by entertainingbythebay. 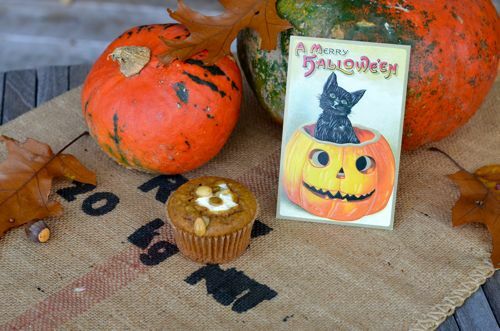 Looking for a pumpkin based treat to satisfy my inner child as well as fully embrace fall and the upcoming holiday – Halloween, I looked no further than my local Starbucks for inspiration. This is my take on one of their seasonal breakfast baked goods. 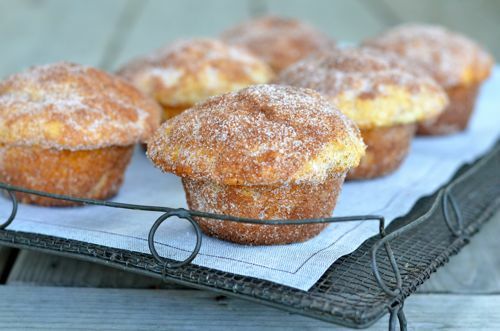 I love the tangy cream cheese filling in contrast to the complex spice of the muffin. The pumpkin seeds on top add just the right amount of texture and crunch. This is definitely one of my favorites! Make it one of yours and treat out this delicious seasonal treat! From by the bay, wishing you tangy food memories! In a small bowl mix the cream cheese, confectioner’s sugar and vanilla together. Place on a piece of plastic wrap and shape into a log. Place in the freezer for at least one hour. Preheat oven to 375 degrees F. Use a 12 cup muffin tray and line each cup with a paper baking cup, preferably unbleached. In a medium size bowl add the ingredients for the batter except the pumpkin seeds. Mix well. Fill each cup about 3/4 full. 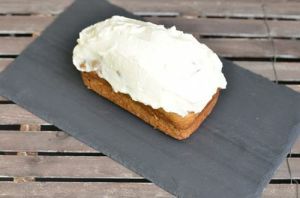 Remove the cream cheese from the freezer and cut into 12 rounds or pieces about 2 teaspoons each. Place the cream cheese into the batter, it should be level with the batter and showing the cream cheese in the center. 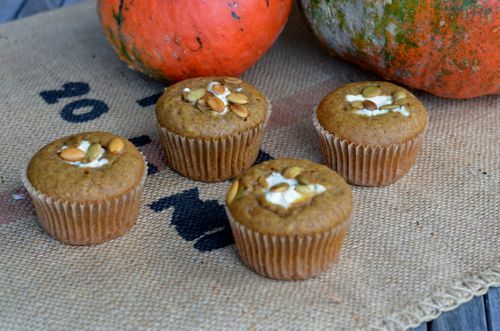 Top each muffin with 5 ot 6 pumpkin seeds. Place in the oven and bake for 20 to 25 minutes until a tester comes our clean from the batter part of the muffin, don’t use the tester in the cream cheese. Remove from oven and let cool 5 minutes before removing from the muffin tray. Serve warm, cold or at room temperature. 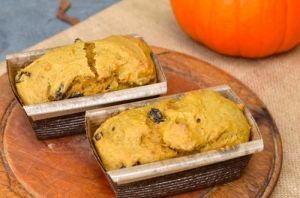 This entry was posted in breakfast, muffins and tagged baked treats, cream cheese recipes, Fall Food, fall recipes, filled muffins, Halloween, Halloween recipes, pepita recipes, pumpkin muffin recipes, pumpkin recipes on May 25, 2014 by entertainingbythebay. If you read New York Magazine, you would have heard that pumpkin is the new bacon ( See link below). I’m not sure I would agree with that statement , however, I sure do love to cook with pumpkin this time of year. I can’t think of a better way to help celebrate Halloween than baking , especially with pumpkin! I was experimenting in the kitchen with some of my favorite ingredients to come up with this delicious and rich coffee cake. It has everything I like best in a good coffee cake, a wonderful streusel topping , with the added crunch of some walnuts. In my family we love the crumbs on top, so this recipe has plenty of crumbs and they are large and chunky when I toss them on top of the batter. The cake is moist from using both pumpkin puree and sour cream. To add to the richness is a nice layer of brown sugar filling. When baking the house is just filled with the delicious aroma of cinnamon and brown sugar. You’ll want to eat this the second it comes out of the oven, but it really needs to cool so that you can enjoy all the layers of flavor. Try to resist or you’ll just to have to eat some twice, warm and then cool as well. The trouble is this cake will just disappear……….probably the ghosts and ghouls have gotten to the cake ! 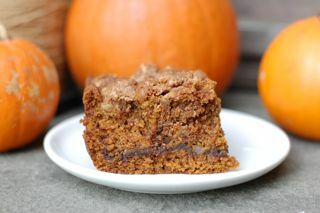 From by the bay wishing you pumpkin, cinnamon and brown sugar food memories! 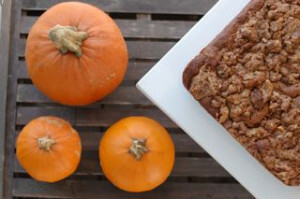 This entry was posted in cakes, desserts and tagged baked treats, coffee cake recipes, Fall Food, fall recipes, Halloween recipes, pumpkin recipes, streusel recipes on May 24, 2014 by entertainingbythebay. I love holidays! I love cooking for holidays, decorating for holidays and entertaining for holidays. I like to make every holiday possible, a little special event, especially with my cooking! My niece tells me, I should make my house by the bay like the house in ” Holiday Inn”. This is a classic movie with Bing Crosby and Fred Astaire. Bing Crosby’s character in the film , moves to Connecticut and buys a country inn. Bing turns the inn into a super club open only on the holidays and is off the rest of the year. If I could make that work, believe me, I would do it. With my love of holidays out in the open, you can be sure that I will be blogging recipes before each holiday in order for you to celebrate. With Halloween arriving in few days here are two treats to make. 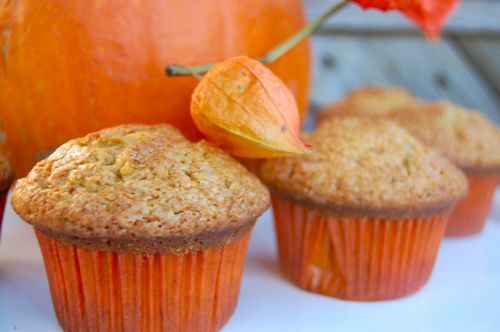 Start the morning right with pumpkin muffins. With anticipation of the day ahead, get the holiday going with this tasty treat, the aroma in your home will be intoxicating. The next recipe is a devil foods cupcake with cream cheese icing the kids and adults will love it. Trick or treat! From by the bay, wishing you treats and fond food memories! Preheat oven to 350 degrees F. Use an electric mixer, cream butter and sugar together until fluffy. Add egg and mix well. Add the dry ingredients alternating with buttermilk and vanilla and beat well. Melt chocolate squares in microwave, heat 30 seconds remove and stir with a spoon until melted. If chocolate is not completely melted repeat process. Cool for 5 minutes and add into the batter combining well. Place paper liners into a 12 muffin tin. Place batter into each cup until about 2/3 filled. Bake in oven for 25 minutes. Cool on wire rack. Keep in airtight container until ready to frost and eat. Tip: If you don’t have buttermilk substitute 2/3 cup milk with one tablespoon of white vinegar and let sit for 5 minutes. Mix the above ingredients until smooth. Keep in air tight container in the refrigerator until ready to frost and eat the cupcakes. 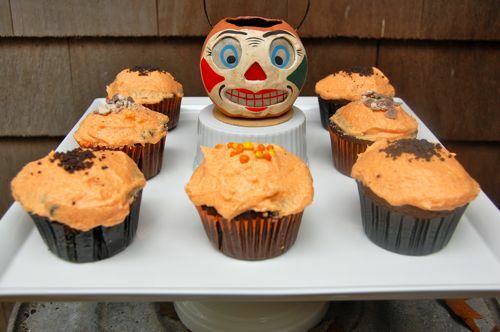 After you frost the cupcakes decorate with sprinkles, crush candy or chocolate cookies. This entry was posted in breakfast, cakes, desserts, muffins and tagged baked treats, baking, chocolate recipes, cream cheese recipes, cupcake recipes, fall foods, fall recipes, Halloween, Halloween recipes, muffin recipes, pumpkin recipes on May 23, 2014 by entertainingbythebay.